A number of poker players descended onto Shuffles in Portsmouth for what turned out to be another successful South England regional final. Paul Turner, who had won the regional final on the last two visits had failed to qualify this time around so there was to be no first Redtooth hat-trick. However, another 123 players were ready to take the crown. All hope was soon lost for Mark Dean, James Jackaman and Pete Allen as they were amongst the first group to hit the rail. After the break the numbers dwindled as we approached a new South England team champion. The ever present Half Moon in Crawley had to relinquish their crown with all three players failing to make the top 60 places. This paved the way for the Moby Dicks to take over as our South England champs with three top 35 finishers and a finalist in Andy Seymour. Andy was backed up well by Peter Dark and Vicky Butterworth. Seat 6: Mervyn Allen – Salmon Leap, Southampton (125,000). As the final table began the tension could be felt all over the card room. 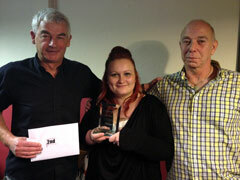 Martin Taylor was the first player to exit and he was soon followed by Claire Hine and Paul Seidenstucker. With Paul Elkins already in the national final the top 7 would all be on their way to Nottingham next March. Gary Hulks, Dave Fry, Mervyn Allen, Alec Pupkis joined Paul along with our two heads-up contenders Antonio Prado and Andy Seymour. The heads-up match was over all over once Antonio was dealt Q-Q and Andy K-J. 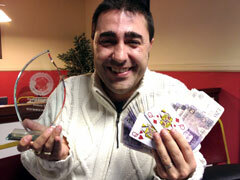 An unlucky situation for Andy and with a board of 4-2-9-10-10 Antonio was our new South England poker champion.